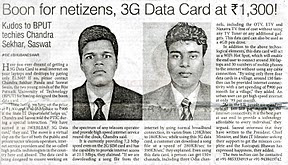 BHUBANESWAR: The 3G device market seems to be hotting up with the latest and cheapest offer from iWEBLEAF, a city based company launched by two young Oriyas, who just completed B.Tech from the Techno School under Biju Patnaik University of Technology (BPUT) this year. They are all set to offer 3G data card (USB modem) at an unbelievable price tag of Rs. 1300 at least for the time being. Chandrasekhar Panda and Saswat Swain have designed the first ever 3G technology-based data card that provides high speed internet at a very low cost. The Wi-Fi and 3G enabled data card is designed to work on the spectrum of any telecom operator providing high speed internet service all the time. This invention is expected to be a major breakthrough in providing mobile broadband connectivity as the biggest challenge in the country to-day is to provide broadband in rural villages and remote areas of the country. "Our goal is to drive a 'highway' of high-speed internet uniting 410 rural regions, where private telecom companies do not develop broadband internet infrastructure due to low demand. By using only 3 to 4 data cards, an entire village with around 150 families can be provided internet connectivity with a net spending of just Rs 900 per month. Similarly, an urban user will get high speed internet at just Rs 99 per month," Saswat on Thursday told "The ET" while giving a demo of the new data card. Interestingly, by using this data card, a person can get to view more than 150 television channels, free of cost without using any television tuner or additional gadgets. "The user can also switch to different networks within two days," he added. The twin inventor's problem is that their innovation is yet to be recognized by the state government. "We are unable to go for commercial production of the device as it requires at least Rs two crores, which we just can't dream of. Currently we are talking with Future Group. Several network operators have shown interest in buying the technology. But we want to bring this service for the common public for which we need the intervention of the state government. This project will create direct as well as indirect employment opportunity in the state. If the volume of this product is increased we can drastically reduce the product price to Rs. 900." These young entrepreneurs have already written letters to the President, Prime Minister, Chief Minister but they are yet to get any positive response from the state apparatus. Compared to market's average price of 3G data card Rs. 2500, iWEBLEAF's 3G data card which comes at half of that certainly will draw attention and lure more users to try high-speed wireless internet services on 3G network. 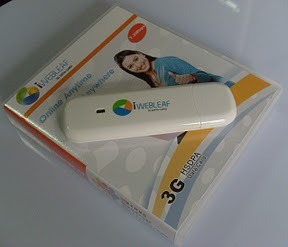 "Our iWEBLEAF 3G HSDPA Data Card can offer up to 7.2Mbps download speed (HSDPA) and 384kbps upload speed. It also supports 2G network – GPRS/EDGE. It comes with genuine IMEI number and a SIM card slot, to use with any GSM operator", Saswat added saying that it also has a microSD card slot to double the device as 4GB pen drive. Currently it is supporting data/sms/call function with USB 2.0 interface and can be used on any Windows (200/XP/Vista/7), Mac and Linux system. The device will autoinstall all required drivers and softwares, which includes a mobile TV application which offers 150+ channels, including three Odia channels, including the OTV, ETV and Naxatra TV free of cost without using any TV Tuner or any additional gadgets.